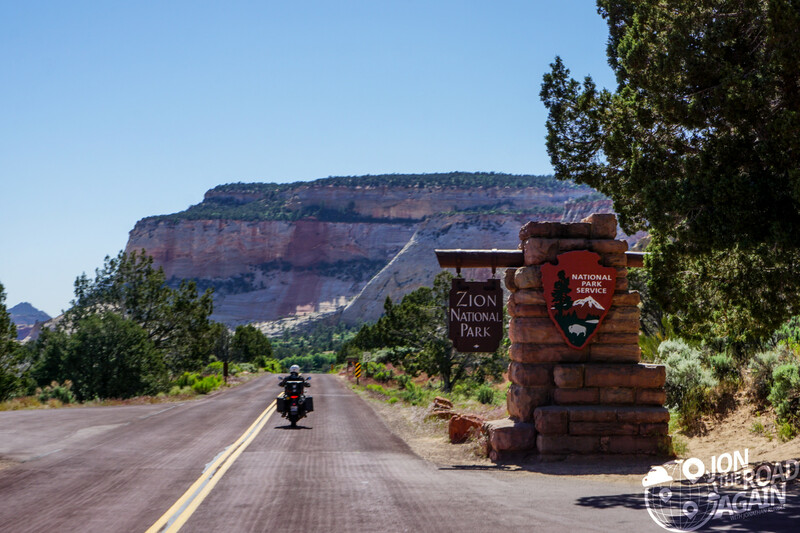 We’ve finally made it to the crown jewel of the Utah National Parks, Zion! 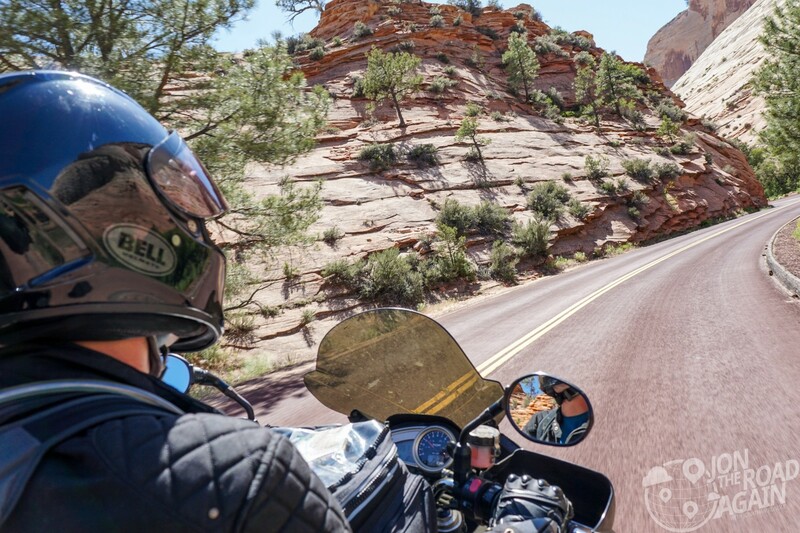 Before we talk about the park, let’s talk about Motorcycling Zion National Park (and Zion Scenic Byway). 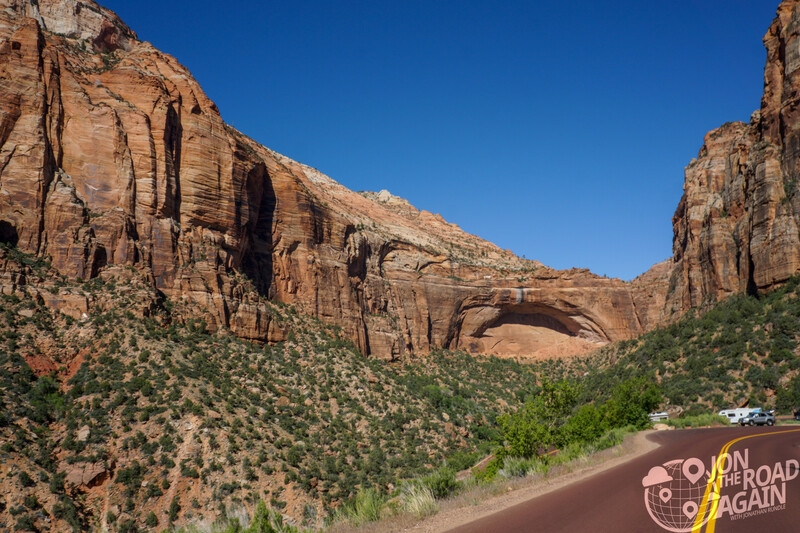 Zion National Park Scenic Byway aka Utah Highway 9 is a 57-mile long highway which, as you might imagine, winds through Zion National Park. We start at the East Entrance. 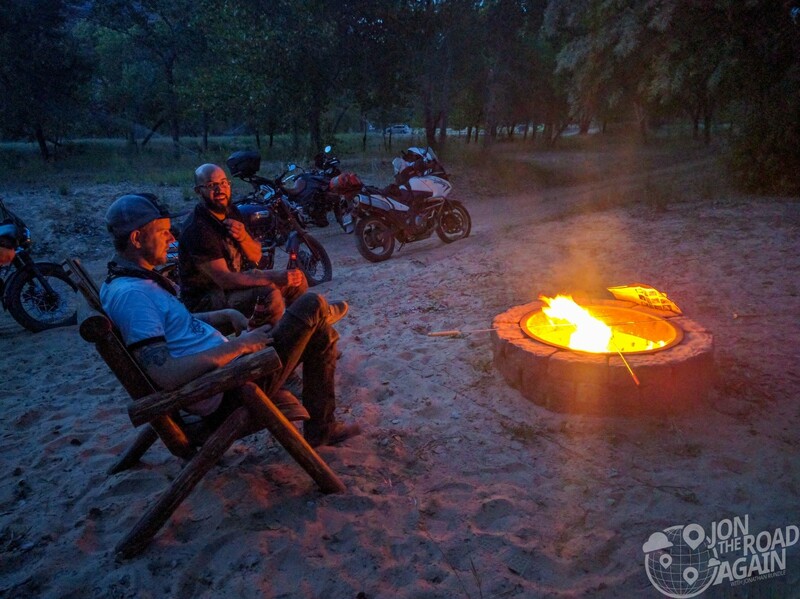 No, we did not invite Mr. No Helmet Harley dude into our little group for the week. ATGATT, buddy! Slicing our way through the sandstone formations was great fun, especially when you consider how twisty this road gets past the east entrance gate. 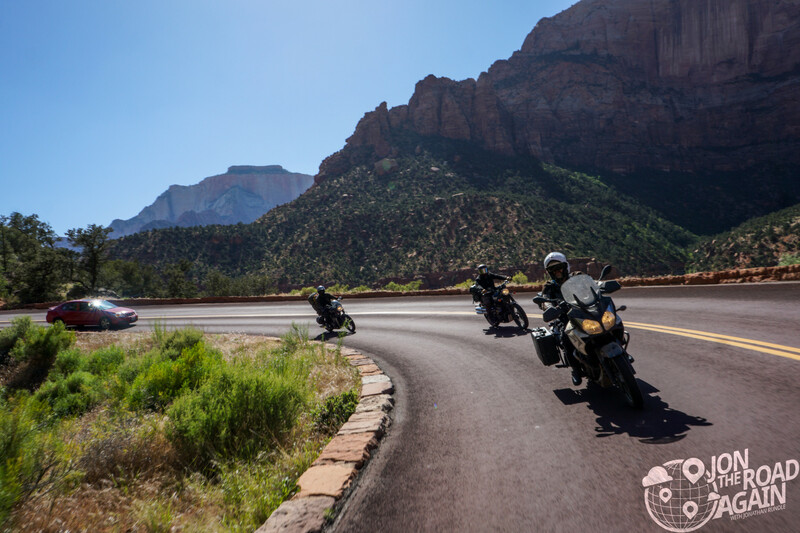 This first section of the road has you in very tight to the walls of the canyons and each turn really very tight leaving the scenery behind the next bend as a surprise. After the tunnel, everything really opens up visually. 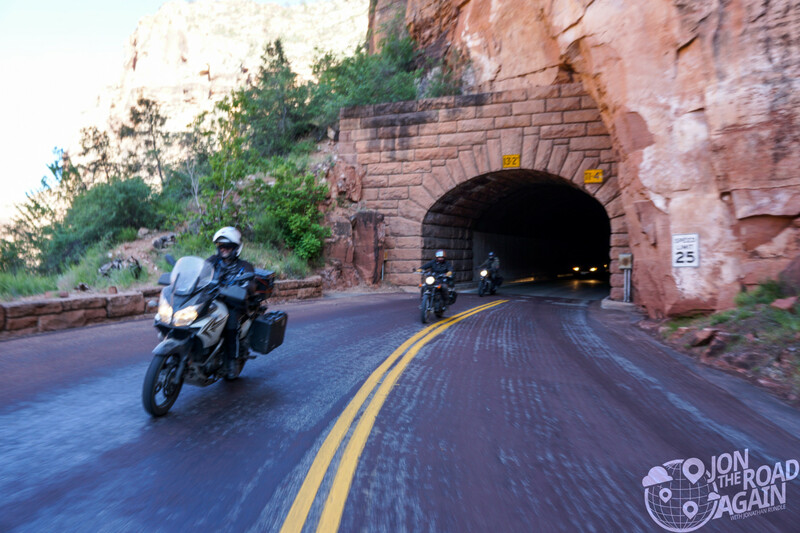 A break in the action comes in the form of the Zion-Mount Carmel Tunnel, which is continually manned by park rangers to collect fees from oversize vehicles. 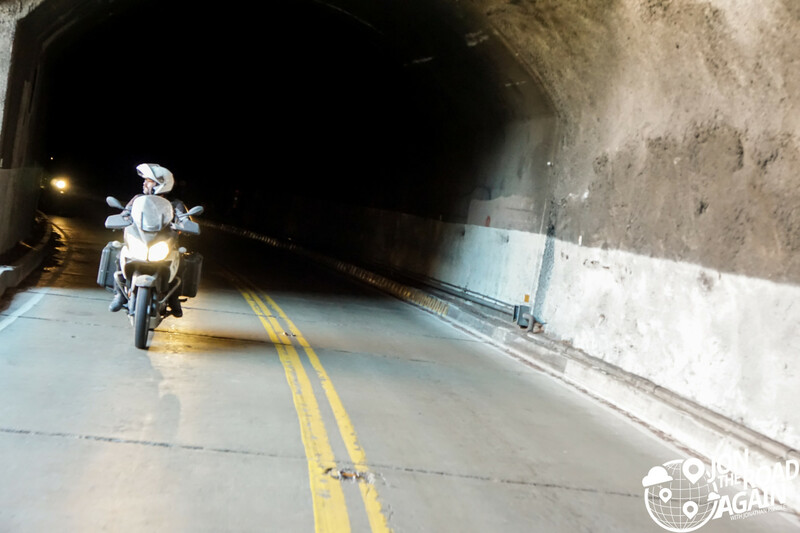 A study by the Federal Highways Administration in early 1989 found that large vehicles could not negotiate the curves of the tunnel without crossing the center line. To ensure safety, the National Park Service began traffic control at the tunnel in the spring of that year. The wait here should only be 15-20 minutes, but, as Michael illustrates, can feel like an eternity when it’s 100 degrees. The tunnel was completed in 1930 by the Nevada Construction Co. The project took 3 years to complete and cost $1,896,000 ($25 million in today’s dollars). Once in the tunnel, there are windows to let you see out toward the Great Arch and other formations nearby. 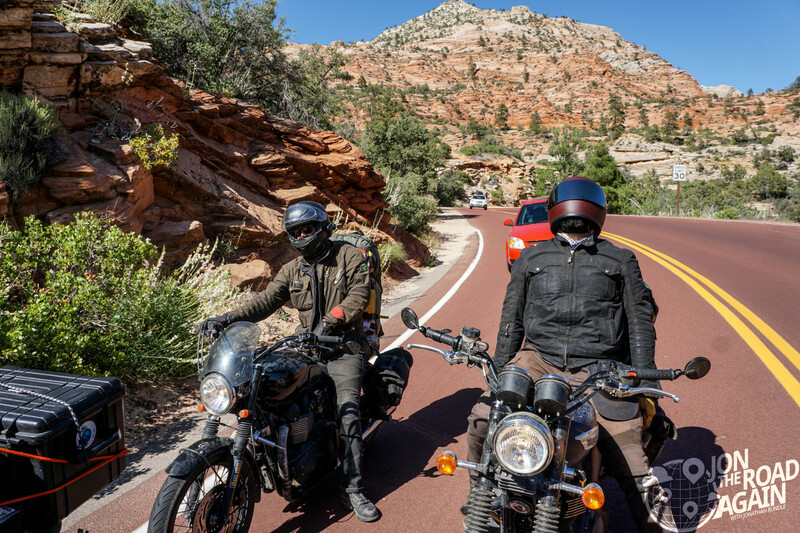 We’ve been riding around deserts of Utah for about a week now. Leather and armored gear + triple digit temperatures has turned us into a group of sweaty nomads. 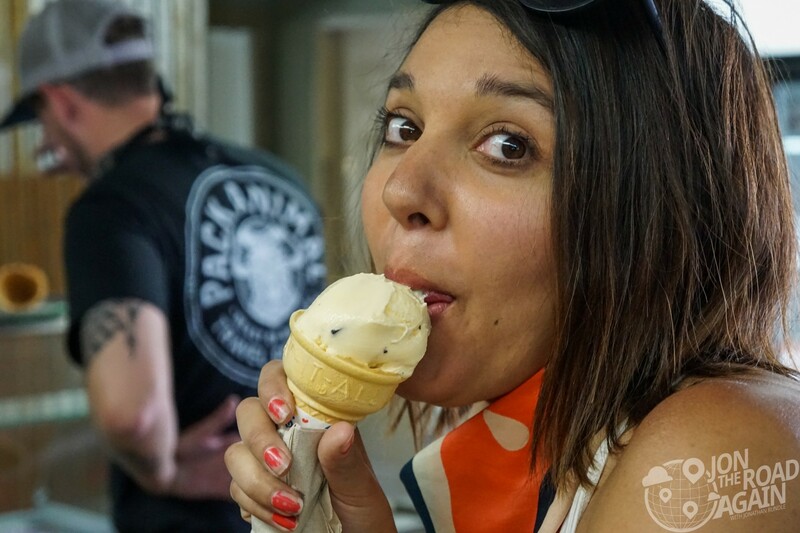 This calls for some ice cream. I think we’ve earned it! 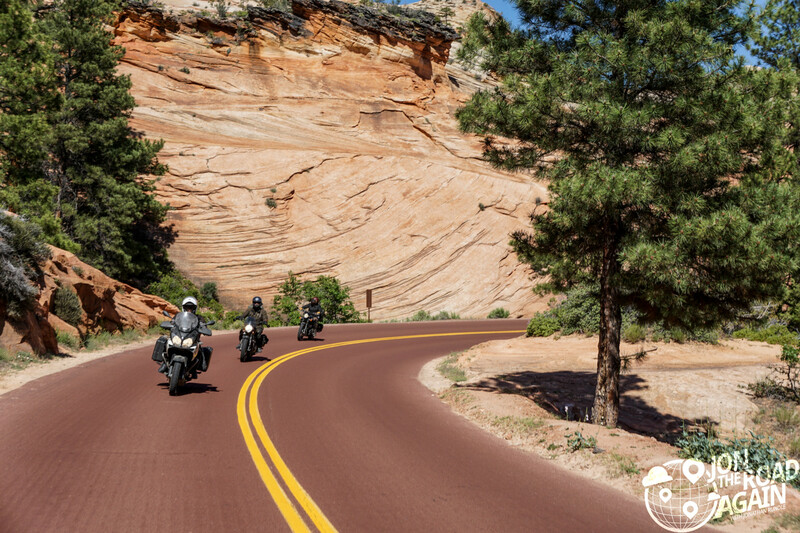 Motorcycling Zion National Park Scenic Byway is a cherry on top of our mototrip sundae. For Zion, Whitney and I eschewed camping for a hotel in Springdale. I think our cohorts are pretty pleased with that choice, too. As the good people we are, we shared our bathroom with our other weary travelers. That means hot showers and access to a swimming pool (the mercury eventually reached 104 degrees today). 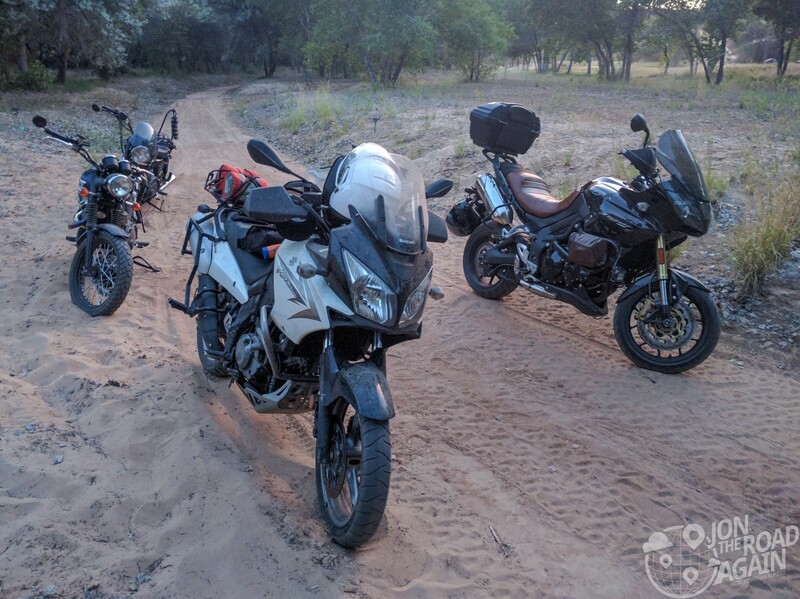 The rest of the crew went looking for a camping spot (not much vacancy this time of year in the traditional campgrounds and RV parks). But, luck continues to be with us as they stopped a local landowner to ask if he knew anywhere they could camp. He offered his land (right beside the Virgin River) as a spot to them for free. Score! Riding two-up in sand wasn’t much fun; okay actually it was. 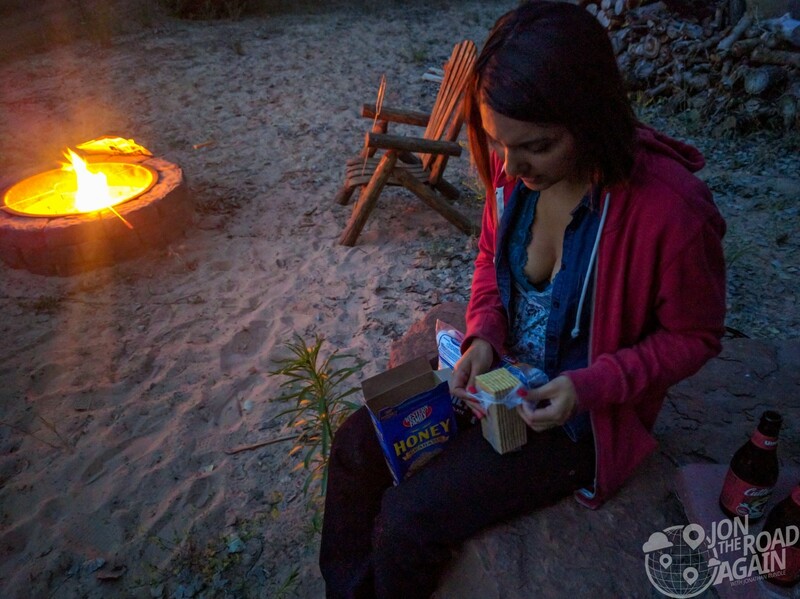 Once settled in, it’s time for what’s really important – beers and S’MORES. The park roads are well-maintained and curvy. 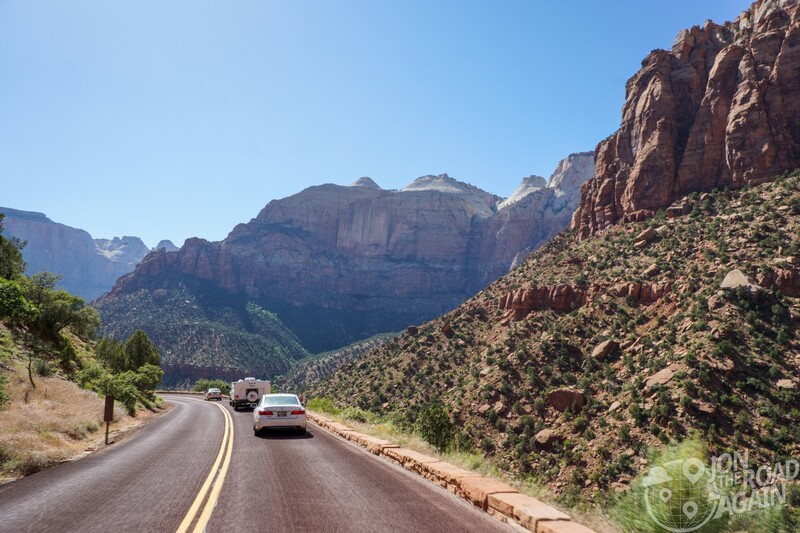 As with many National Parks, the roads fill with RV’s and tourists gawking at the sights. If you’re trying to carve the canyon, you’ll be a little disappointed. 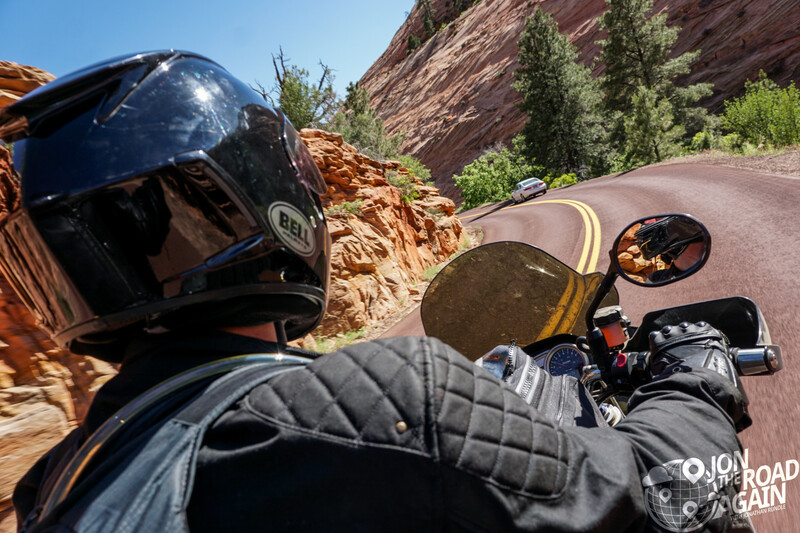 If you go at an-off peak time, you might have better luck finding an open road. Still, the road is a beautiful one and those sights deserve your gawks, too. 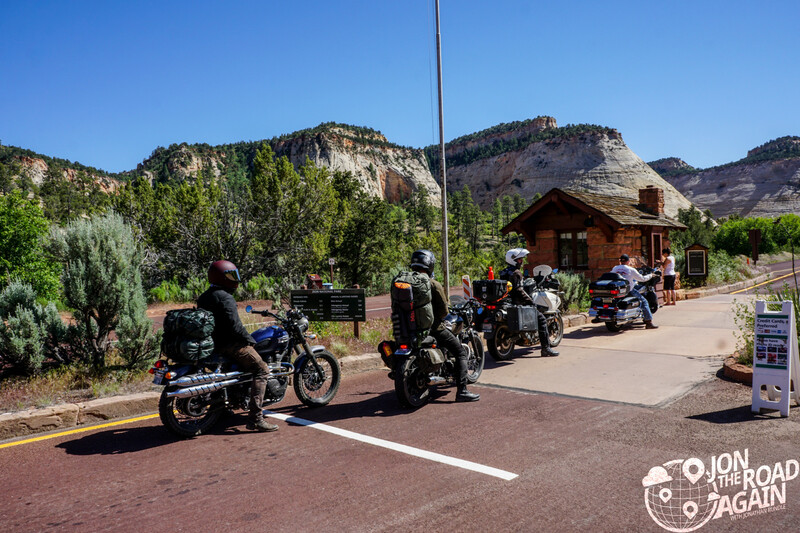 Off-season travelers can ride the road into the park, which is served only by shuttle bus in the summer months.